Last year I wrote a post called The Anatomy of an Outstanding Lesson, which has become by far my most viewed post with almost 10,000 page views. Clearly teachers are hungry for this kind of thing. But it’s become increasingly obvious to me over the past few months that many of my notions about what might constitute an outstanding lesson have been turned on their head. It’s not so much that I was wrong, more that my understanding was incomplete. If we accept, as I’m sure we do, that as teachers we want to accomplish different things at different points in our schemes of learning then it can’t possibly be right that there is just one acceptable template for great lessons. We start by explaining a new concept, its subject specific vocabulary and how it connects to those things students have already learned. When this exposition is complete and students’ basic understanding is secure, we then move to demonstrating, Blue Peter style, a model of how this concept might be applied and deconstructing how it was put together. Once the processes are clear we can then move to providing a scaffold to enable students to apply the knowledge they have learned. Then, when students have met a minimum standard of control over these processes when will allow them, with clear guidance and feedback to practise all they have learned independently. And finally, when they have mastered the skill they have practised it is time to connect new concepts and increased complexity; the cycle begins again. It should be clear that no part of this cycle is really possible without any part. If you have failed to explain the concept you hope students to learn they will become confused and quickly become lost. If you don’t explicitly model how to apply this new knowledge then the process will remain mysterious; some will pick it up but many won’t. 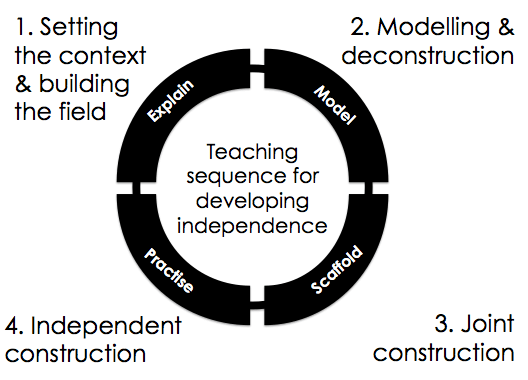 Neglecting to scaffold throws students in at the deep end before they are ready to swim. The arm bands offered by a competent teacher provide a much needed feeling of safety and equip students with the ability to take risks within a safe environment. And not allowing students to practise means that they would never really encode the knowledge they’ve learned and will miss the opportunity to transfer concepts from working to long-term memory. This may seem obvious, but it does not reflect the way many teachers feel they are expected to teach. Or perhaps it does; increasingly, it has become an expectation that each part of this cycle should be, briefly, included in one 50-60 minute lesson. The madness inherent in believing that learning takes places in neat, lesson-shaped chunks has resulted in the Four Part Lesson, the Ofsted lesson and the reluctant acceptance that if we want to please observers we must perform a Monkey Dance and conceal the (essential) parts of our teaching that certain people seem not to approve of. Skipping over the fundamental need to explain, model and scaffold in order to demonstrate the ‘preferred’ Ofsted method of minimal teacher-talk and independent learning for its own sake may have done more to damage children’s education than any other single dictat. It is my contention that while you may not want or need to cover just one of these elements over the course of single lesson, they may equally be times when it is necessary. As Nuthall tells us, “learning takes time and is not encapsulated in the visible here-and-now of classroom activities.” That being the case we need to allow students the time they need by providing them with the rich, fertile soil of excellently crafted lessons devoted to each part of the cycle. There must be an acceptance that any and all of these four types of teaching can be considered outstanding when done well. Currently, teachers fear to teach lessons described variously as didactic, teacher-lead or ‘from the front’. This must change. We need to allow teachers to teach and, by extension, children to learn. My intention therefore, is to outline, over a series of posts, what I think make be a template for great teaching in each of the four essential parts of the teaching cycle. Hopefully we might all benefit from seeing that it’s not only desirable but also possible to teach outstanding lessons that explain, model, scaffold and those in which students practise what they’ve learned. I will post on Stage 1: Explaining later in the week. I am not proud of this but I frequently teach a whole string of lessons that are just satisfactory or worse. Often they are not just unbalanced as they focus on one stage of your cycle, they are, if I am honest, a bit dull. However, although polished individual lessons are preferable, mine are still pretty effective because I have thought really carefully about the best route through the topic, working back from the outcome I want. Often this planning takes me ages and leaves me with little time to polish up individual lessons. I could get a great observation without any of this sort of planning but deep down I would know the lesson was pants. My planning does involve the sort of activities mentioned in your cycle but it is topic specific and begins with the subject matter. I have a nagging feeling that your template could become the equivalent, for a series of lessons, that the 3 part lesson (or whatever) is for individual lessons currently. I like the principles but they should not become the starting point of planning. That should be the facts, ideas and concepts you want children to learn. You start Heather by criticising your lessons as satisfactory and dull. What are you comparing your lessons to? You then say that they are pretty effective because you have been working backwards from a desired outcome. Well, to me this is proof that you are doing the right thing as effective and rigorous learning is the most important aspect of all. Teachers are encouraged far too much to produce exciting ‘whistle and bells’ lessons at the cost of effective learning. As far as I’m concerned a teaching learning cycle as outlined in these posts could easily happen over a series of classes and they aren’t going to fit into neat 40 minute or hour chunks. This kind of teaching isn’t dull and is very supportive. The lessons move from more teacher control to more student control over the course of the cycle, but that may not be witnessed in one class. And, I think therein lies the problem with Ofsted style inspections. Ah Heather, but of course. And that will be the subject of my next post. Worryingly, in my place, there’s a very strong push towards making this approach the default one – observable ‘progress’ in a 20 minute chunk, not just for the sake of Ofsted but because our SMT have swallowed the idea that THAT is best practice T&L. How very sad. What can they possibly base that opinion on? It certainly isn’t evidence. based mostly on fear, I think: of Ofsted, certainly, and of not being seen to be doing what others are. We’ve had a lot of Local Authority provided training recently, and that’s the direction this area is going. I’m unsettled by it, if I’m honest. Us too. Exactly same story as above. Obs graded on Ofsted grading sheet. LA in all the time. Teachers given RI if progress not ‘seen’ in 20 mins observer in room. All rest could be Oustanding/good. What of episodic lessons for practical subjects or otherwise? Understanding is what you’d expect – I explain (or the team reads / has a presentation) and they “get” what is expected of them, could basically explain it to someone else if they had to. Application involves the team doing what they’ve learned, in a supported environment – I’m still demonstrating, guiding, revisiting explanations etc, but the team has started “doing”. Commitment involves the team applying the practice in other contexts, without further guidance & support, but still very much from the point of view that someone else has asked or expected it of them. Finally Ownership happens when team members have achieved mastery of the new practice and it becomes completely embedded in the way they do things; done because it feels right, not because someone else is saying so. The steps I’m describing don’t map exactly to the stages in your cycle above, though they do follow the cycle. What’s interesting is that I have no expectation that they’ll all be at the stage at the same time, or of how long it will take to move from one stage to another. What’s crucial for me to be successful in supporting the team to adapt is that I understand what stage they’re at, and I shape my inputs accordingly. Also, team members can’t be in the application / commitment stages for lots of difference new practices at the same time. They’re the stages that take the most hard work and concentration. So if planning lots of inputs they need to be staged. Mastery / ownership of one or two new practices before starting the cycle again with something else. I’m interested that this teaching of adults can be so flexible and responsive to their needs and stage of learning (and it needs to be!) but that in school-based teaching of children this is often not the case. So, I wonder whether the similarities are because this type of sequence is just sensible or if it taps into some universal truth about how people learn? I’ll think further about your headings and see if I can amalgamate them into my model. I decided “Understanding” covered the first and maybe second stages in your cycle. (There’s probably less modelling and deconstruction necessary for adults*). Application seems to me to map to your joint construction / scaffolding stage. Commitment is the independent construction phase. By the time my teams have “Ownership” they’re ready to teach others – and want to! *The insight for me in considering your cycle is that where I have team members who seem to understand what’s expected but can’t deliver, I may need to go through a modelling and deconstruction phase. Although maybe some/most adults can skip this if they’ve got well-developed relevant understanding from other sources, if they haven’t that’s where the extra input may be needed. I’m going to give that a try next time someone seems stuck. This was a great blog post! I had to search the web quite a bit trying to find someone having similar ideas about teaching as I do. I was a junior high school teacher and currently I’m teaching adults and basically only ICT skills (specific softwares). I wrote my ideas about teaching cycle in my blog post: http://www.cloudriven.fi/en/blog/teaching-and-learning-it-skills/ Actually I began forming my version of teaching cycle as a counter strike to the prevailing idea (at least here in Finland) about different learner types and how a good teacher adapts his/her teaching style according to that. Basically my model seems to exactly the same as yours, only a bit simpler. I lack the proper channel to post my ideas thoroughly, so my blog post is sort of stump. I would still appreciate your comments about my thoughts. I’m a massive advocate of the TEEP cycle which is based on similar principles. Cyclical schemes of learning are becoming increasingly important in my view – particularly with the shift towards linear examinations in all subjects.